On the way to the gym this morning, I heard this story on NPR in which Eric Weiner reported that Moleskine’s business is booming, and research shows that all the cool kids write in notebooks now. I was fascinated but also horrified by this story. Listening to an interview with a guy who revealed that he wrote in notebooks like it was a new idea made me feel sort of the way I did when the lady who wrote Freedom Writers came to town and everyone at the school where I worked got very excited about her revolutionary teaching technique of having her students write in journals. My students have been writing in journals every day since I taught my first writing section in 1990. And as for notebooks? 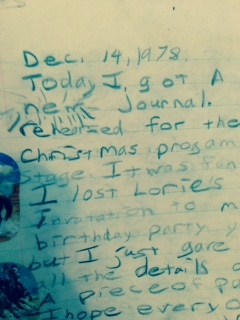 I’ve been keeping notebooks since 1976. 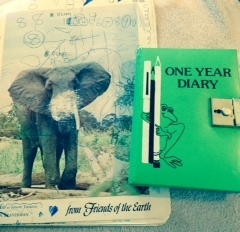 These were my first notebooks, a diary and a poetry notebook kept from 1976-1977. The poems were mostly in praise of my dad. Did anyone else have one of these? 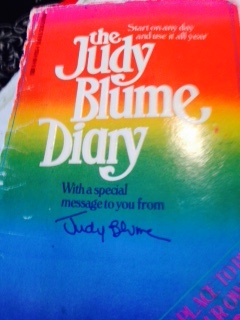 I found Judy Blume soothing during a junior high experience so hellish that people don’t believe me when I tell them the details. On November 17, 1982 I wrote, “If I get yelled at today by ONE more person, I’ll go weird.” I wrote the exact same line on November 18. On December 27 1982, I wrote, “I’m going to be in charge of my life.” I wrote the same thing May 26, 2015. 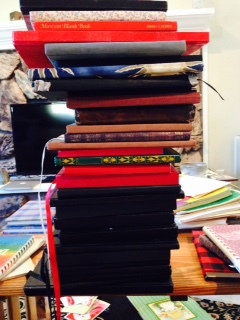 Notebook Jenga. They all fell down right after I took this picture. This isn’t even half of them. 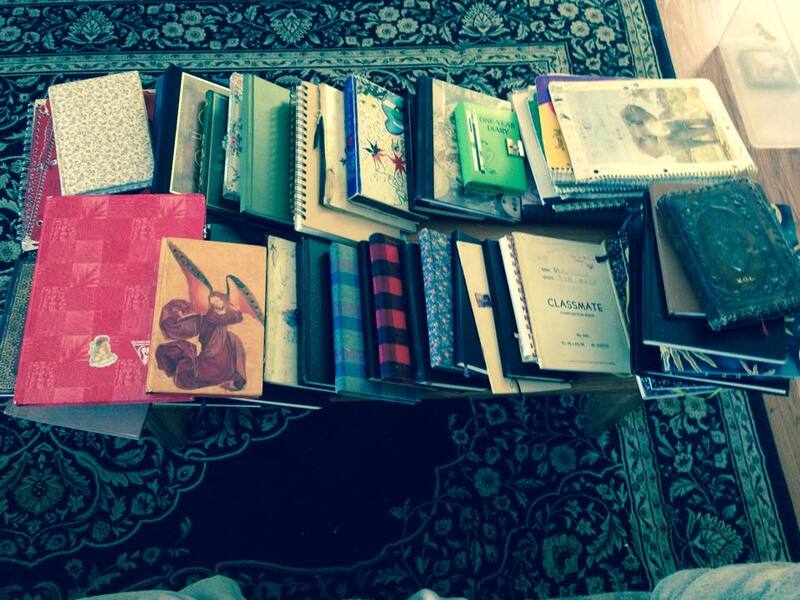 I have 78 notebooks. Only 58 conceded to having their picture taken. My cat thinks I’ve lost my damn mind. The outside covers are eclectic because the most important thing is generosity of line per page. Moleskine has the line situation on lock. They didn’t mention this crucial fact on the NPR story today. They should have interviewed me. I could have told them about notebooks. It’s all about generosity of line to page ratio, baby. 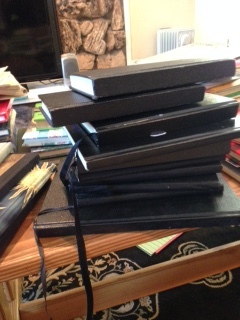 Notebooks are not a trend. Notebooks are not a charming anachronism in an invented war between digital and analog. 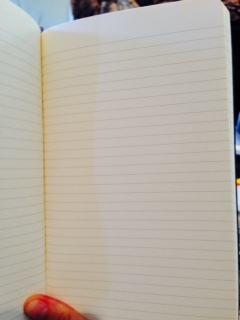 To many creative people, notebooks are an extension of the self. Anne Frank, Anais Nin, Leonardo Da Vinci, just to name a few, knew it too. 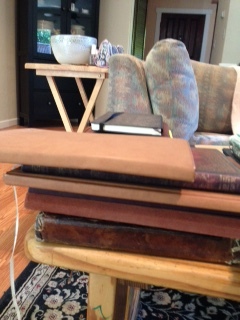 I know there is some madness here in my stacks of notebooks. I have eyes. But to me, notebooks are storage units, warehouses, playgrounds, priests. To me, notebooks are the midwives of art. New notebooks are still exciting. Maureen O’Leary Wanket is the author of the Giant Squid Books young adult novel How to Be Manly, Geminid Press’ Urban Fantasy The Arrow, and the upcoming adult literary novel The Ghost Daughter through Coffeetown Press. Her short stories appear in Night Train Journal, Revolution John, and the forthcoming anthology The Female Complaint. Her poetry appears in Brackish Vol. 2, and a 2016 publication from Heyday Books exploring the environment and culture of Sacramento Valley. 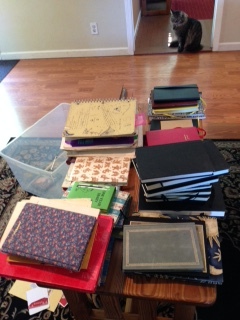 And yes, she just referred to herself in third person, but what else can you expect from the lady with 78 notebooks?